With the big names in Social sites being Myspace and Facebook here in the USA, you may be wondering what does everyone in Japan use. While many Japanese are starting to venture onto Myspace, since they have a global version in many different languages (including Japanese), the majority of people use MIXI as their social network of choice. WhatJapanThinks.com posted an article on Japan’s SNS (Social Networking Service) usage, and an overwhelming 90.3% of the people polled used MIXI. The other 10% were scattered between GREE, Myspace, and a few others. If you have gone ahead and chosen not to finish reading my article, and clicked on the MIXI link, you may have noticed 2 things that have stopped you in your tracks. The site is invite only. The first one is a very interesting. With the whole premise of social networking sites being social, why would they be an invite only community. WhatJapanThinks.com also has another article that states nearly 2/3 of everyone on MIXI has never invited someone else to join. I find that so weird. But then again I hear that it many places in Japan, its common to not see foreigners. Peter over at JList.com always talks about how he is usually the only foreigner around during his day. So the fact that MIXI is invite only doesn’t really surprise me. Plus, in some abstract way I guess you could say that everyone on MIXI is connected to each other somehow. I was lucky enough to be invited by a friend when I first found out about MIXI from a co-worker that used to live in Misawa. The main reason I joined MIXI was to help me with learning Japanese. One of the biggest hurdles in learning any foreign language is having someone to practice with. What I found out after joining MIXI was that there are a lot of Japanese looking for English speakers to practice their English on. So its a mutual relationship. Plus, I have even made a few friends on MIXI that live here in the Tampa Bay area. So, if you are interested in checking out MIXI for yourself, just email me or leave a comment, and I will send you an invite. If you use FireFox, you may want to check out the plugin Rikaichan. It allows you to put your mouse over Kanji and see a translation of it. The plugin has a large dictionary and works really well for navigating MIXI. One last interesting big about MIXI: When MIXI went public on the Tokyo Stock Market, Kenji Kasahara founder of MIXI, became a USD billionare! Yea, MIXI is that huge. After doing a bit of research into a few people that I invited not being able to get past MIXI asking for a mobile number, it seems as though if you use a disposable email account (Yahoo, Hotmail, Gmail, etc), MIXI requires you to use a Japanese mobile phone number upon registering. So if you do want an invite from anyone, you must use your real ISP email, or a less used service so MIXI thinks its a real address. Seems its more or less official now. 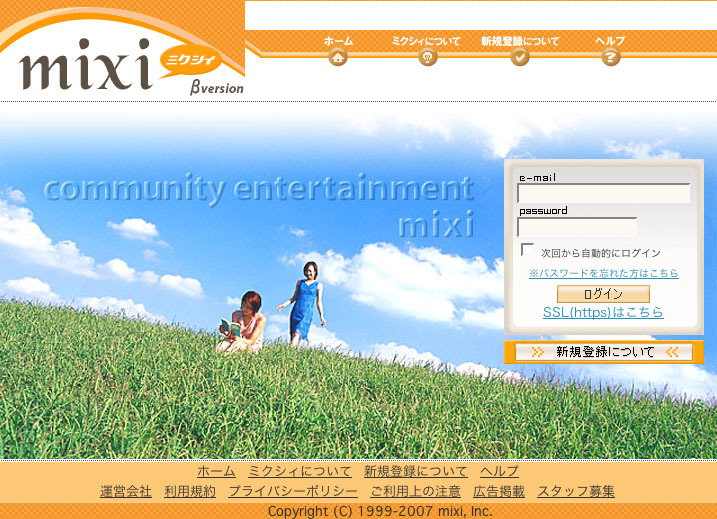 You have to have a mobile phone address thats Japanese in order to sign up for MIXI. Sorry everyone. Sad day for those wanting to learn Japanese. I will keep everyone updated here and with a new post if things do decide to change.